I had three goals for February. My first goal was to exercise at least ten minutes a day. I did fairly well on this goal. There were six days that I didn’t exercise. My second goal was to do cardio at least 5 days a week, and to do yoga and strength training at least 3 days a week each. I didn’t do very well on that goal. My third goal was to complete the Planks and Thanks Challenge. This involved doing a plank every day for as long as you can, trying to increase your time each day. Then you also write down three things you are grateful for each day. I didn’t do this every day, but over the course of the month I increased my plank time from 25 seconds to 55 seconds. My goals for March are similar. My first goal is to exercise at least ten minutes a day. My second goal is to do cardio at least 5 days a week, and to do yoga and strength training at least 3 days a week each. 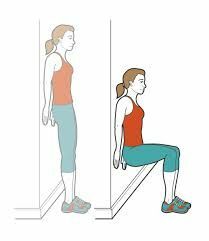 My third goal is to do a wall sit challenge, where you do a wall sit every day for as long as you can, trying to increase your time each day. 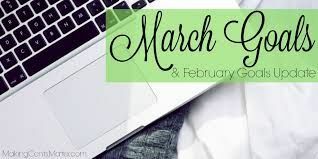 I'm looking forward to a great month of March! Great job on all your exercise successes! I know how much you are motivated by the challenges! The wall sit challenge sounds interesting! I think I could do that one now! Fantastic.... thanks again for joining my exercise feats challenge. It starts tomorrow, and goes until the end of March. You can find it each day on your start page on the right side under my spark challenges. good goals and know you'll do it! Good job on making goals. It's always good to push ourselves. Way to go! You did a good job on your February goals! Your goals for March are great. Keep up the good work. I'm impressed with your plank time. It's something I'm working on, but not doing so well. I like the Planks and Thanks Challenge idea. 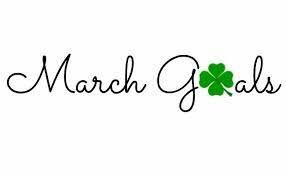 Wishing you another great month in March. Good job with your February goals, I am sure you will do equally as well with your March goals,. Goals are good. Continue to celebrate your successes!